Up to 14 days before arrival it is free of charge to cancel and modify the reservation. 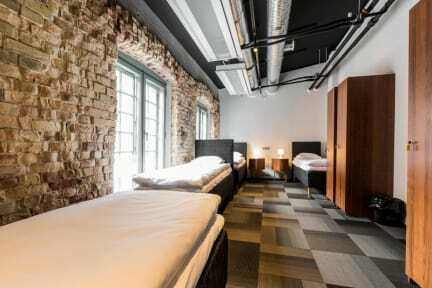 Welcome Hostel is a new innovative concept hostel in the center of Tallinn, located in the trendy Rotermann City. The hostel has 26 rooms, most of which are 2-5 person rooms, but there are also larger rooms for groups of 7-10 people. It is possible to book both private rooms and bed in a room. All rooms have comfortable beds, personal lockers for your personal belongings, clothes and suitcases. Welcome Hostel is a quiet hostel but customers expecting more socializing should head to the bars that are right around the corner. Rotermann City is a cozy and friendly urban environment characterized by historical atmosphere, outstanding and tantalizing architecture, openness, uniqueness, and obviously the excellent location – right in the heart of the city. The rooms have comfortable double mattress beds, free Wi-Fi, locker and air conditioning. Toilets are available on every floor; showers are located on the hostel’s fourth floor. 3rd and 5th floor have cozy lounges with sitting area where you can spend time with your friends. The lounge area has free Wi-Fi. Possibility to buy drinks. Good location, nice and brand new. No hostel atmosphere at all. If you are a backpacker is not your place. La calidad precio del hostel justa,la zona muy buena,el hostel esta en un edificio muy moderno.Como puntos negativos diria que no tiene ambiente de hostel,habitaciones no del todo limpias y un poco abandonadas y eso que se ve nuevo,las zonas comunes sin ambiente de gente y las cocinas comunitarias muy nuevas pero sin utensilios para cocinar😓la zona de las duchas un poco sucias y para renovar totalmente,los lavabos sin pestillos para cerrar🤦🏻‍♂️la puerta,el hostel no tiene opcion a desayuno. Se notaba que habia gente viviendo y por eso se sienten dueños del hostel y de las habitaciones Compartidas. Por este motivo pedimos un cambio de habitacion y no tuvieron problema en cambiarnos a una solos sin pagar nada de mas. Los baños estuvieron sin limpiar durante toda nuestra estadia al igual que la cocina. Although we slept one night, we didnt like it. Just one toilet per floor and dirty. The stuff is not nice, also, she did not speak english, and you have to pay for basic things as renting a towel. We didnt use the bathrooms because it was disgusting, not clean and in a diferent floor than our rooms. El sitio físicamente bien y buena localización. De resto es que es una guarrads extrema. No limpian nada, uñas en el suelo, manchas, baños sucios sin pestillo. He puesto un comentario con fotos en TripAdvisor. No volveré a este hostel. Sólo se salva el chico de las rastas. El resto asqueroso pudiendo ser muy buen hostel porque es nuevo, tiene buena ubicación etc.